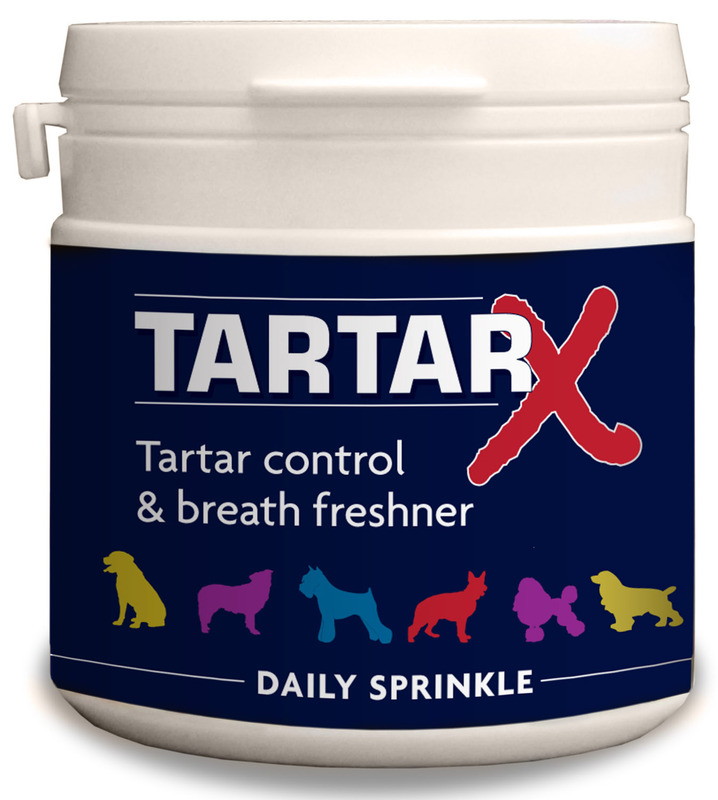 Phytopet Tartarx helps to control tartar and freshen breath, just by sprinkling on your dog's normal food. It is made from 100% natural, human-grade ingredients including seaweed fragaria and parsley. Studies show that a small daily dose of these sea vegetables can be very effective in helping to safely reduce and prevent dental plaque and tartar in dogs and most other animals, and it’s so easy to use, just sprinkling a little Tartar X powder onto your pets food! So how does it work? These sea vegetables contain a multitude of important trace minerals including Calcium and Magnesium which support healthy teeth and gums. They are also rich in polysaccharides, Chondrus crispus contains a very high percentage of polysaccharides and is an important ingredient in toothpaste. Polysaccharides are known for their mucilaginous, viscous properties which exhibit antibacterial and anti-viral actions. In studies, these polysaccharides have also been shown to inhibit plaque and tartar formation. By creating a thin viscous coating of film on the teeth and gums these sea vegetables help to support a healthy bacterial balance in the mouth. An over growth of bad oral bacteria is one of the major causes of gum disease. The waste product caused by these bacteria is extremely acid causing erosion of the teeth's enamel. The waste from these bacteria can leak through the gums into the blood stream, affecting major organs of the body. Due to the ability of these sea vegetables to inhibit calculi formation, Tartar X may also be useful in preventing urinary calculi and crystals etc. Another positive action of these sea vegetables is that they are rich in iodine. Iodine is important for skin and coat, and thyroid function, the thyroid helps control the body's metabolism. Iodine also plays an important role in the removal of toxins from the body, and assists the body in utilizing various minerals, like calcium and silicon. Fragaria: The leaves and roots are used in treatments of Tartar and gum disease. Fragaria is the homeopathic treatment of choice for plaque and tartar control. Traditionally Fragaria was also used to treat the liver, intestinal and stomach disorders. Peppermint: Well known breath freshener and digestive aid, although, traditionally peppermint was used for dental plaque. Parsley: Traditional breath freshener with the added benifit of supporting kidney function. Used for windy colic and as a gastric tonic. There are currently no questions for Phytopet Tartarx - be the first to ask one!